Two weeks on since its maiden flight, the Russian MC-21 narrowbody airliner has taken to the skies again from the Irkutsk Aviation Plant airfield, OEM Irkut Corporation reports. The second flight was made to confirm the aircraft’s runway performance projections and test the operability of its systems. No significant problems were found. The third flight was completed on June 15 as part of the factory development testing program. During the 1.5-hour flight the aircraft was tested for an expanded flight envelope and for the full cycle of wing configuration changes from take-off to cruise flight. The prototype first flew on May 28. The maiden flight tested the aircraft’s aerodynamic stability and controllability, as well as engine operation. It revealed no factors that could impede further testing. The prototype currently in testing is the MC-21-300 baseline variant of the aircraft, meant to seat from 163 to 211 passengers. It is powered by Pratt&Whitney PW1400G engines. Certification in Russia is scheduled for 2019, to be followed by international validation in 2020. There are plans to equip the МС-21 with Russian-made Aviadvigatel PD-14 powerplants. The engine is expected to be certified in 2018 or 2019. Irkut’s MC-21 backlog comprises 128 firm orders. 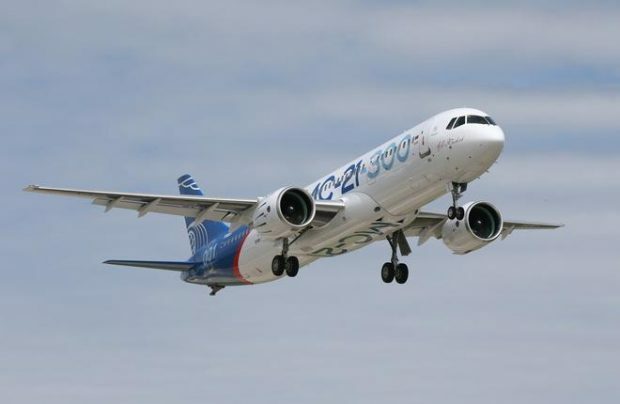 There are also plans to develop a shorter modification for 132-165 seats, provisionally known as MC-21-200.